The history of the State Operetta Dresden is influenced by the 240 years of operetta tradition. This still existing tradition was started, among other places, at the Alberttheater, Central-Theater and Residenztheater. 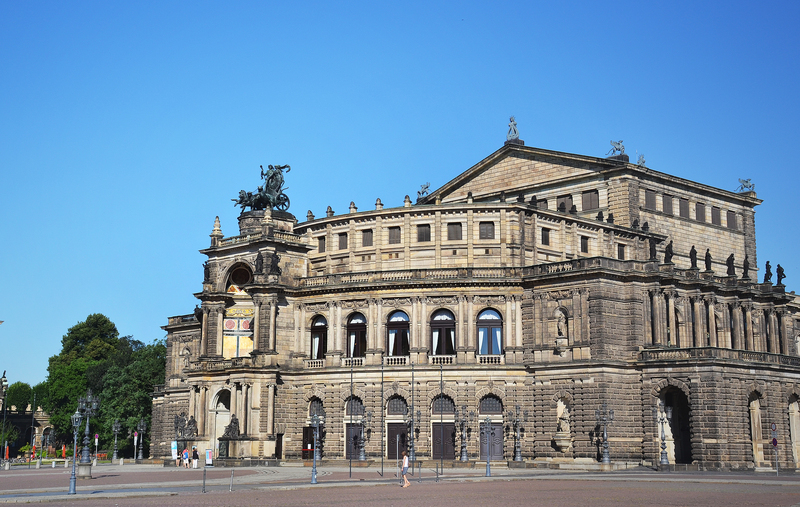 Dresden’s cultural life was heavily affected by the destruction of the city in February 1945, but a few months later the first theatres were re-opened in other locations. In the following years more and more new theatres were founded to satisfy the people’s need for entertainment, and the authorities generously granted new concessions. One of these new theatre groups was started in the district of Leuben and the “Feenpalast“ (“Fairies‘ Palace“) – an inn that also house a ball room dating back to the 20s – was gradually turned into a theatre. This conversion was the first in Saxony concerning a theatre. On 18 August 1947 the Apollo-Theater was oened and on 2 October The Merry Widow was performed, which marked the beginning of today’s State Operetta Dresden. Due to close cooperation with the “Constantina“, today’s Theater Junge Generation, an extensive prrogramme could be assembled. Since 1967 the theatre has been called State Operetta Dresden. For ten years Wolfgang Schaller has been the manager of the State Operetta Dresden. Besides opera-bouffe and musicals, the programme mainly consists of operettas with a special focus on political operettas starting with Johann Strauss and Jacques Offenbach, and the revival and reconstruction of forgotten or repressed works. In relation to this scientists, representatives of the media and theatre specialists are invited to regularly held conferences. Work by Johann Strauss is particularly highlighted: well-known operettas like The Bat, A Night in Venice and The Gypsy Baron, as well as nearly unknown ones such as The Roman Carnival and Prince Methusalem. Since 2011 an annual Johann-Strauss-Festival is held when many operettas from the State Operetta Dresden’s wide Johann-Stauss repertory are performed. The productions of work by Strauss and Offenbach has been recorded since 2005 in cooperation with MDR Figaro and later on also with Deutschlandradio Kultur and is published as part of a project called Radiomusiken.